Hereford bed and breakfast travel guide for romantic, historic and adventure b&b's. 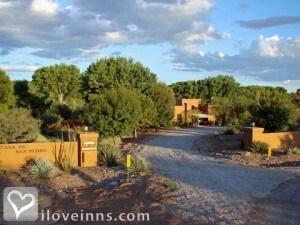 Browse through the iLoveInns.com database of Hereford, Arizona bed and breakfasts and country inns to find detailed listings that include room rates, special deals and area activities. You can click on the 'check rates and availability' button to contact the innkeeper. Hereford AZ is located in Cochise County, in the Southeast corner of Arizona. it is five miles from the Mexican border, and along the famous San Pedro River - one of the few undamed rivers remaining in Arizona. This river corridor is home to over 355 species of birds, 82 species of mammals. Surrounded by the mountain ranges of the Sky Islands, this river valley has been listed by the Nature Conservancy as on the the Last Great Places on Earth. By Casa De San Pedro. As an unincorporated community, it is surprising to note that Hereford, Arizona still manages to attract large number of visitors every year because of San Pedro Riparian National Conservation Area, which is located in Cochise County. Only about 11 miles away from the center of the community of Hereford, the San Pedro Riparian National Conservation Area is a favorite of people who love to watch birds. The Conservation Area is home to about 500 bird species. The Arizona Folklore Preserve is also another must-visit site in Hereford. Live performances are often shown here to entertain both locals and visitors. Our Lady of Sierras Shrine is a religious site with an interesting architecture. By Casa De San Pedro. When traveling to Arizona, be sure to make a stop at a quaint little town called Hereford. Spend a day or two in a Hereford bed and breakfast that offers amazing accommodation. The best part of staying at Hereford is that there are so many things to do - up to 20 different things! From exploring Arizona's Indian Country, trips around Flagstaff, appreciating ancient ruins and majestic landscapes, to the classic visit and sightseeing in the Grand Canyon, Hereford innkeepers will make sure that your stay will be really worth your while. By Casa De San Pedro.